The legendary stage musical CARRIE will soon be available for licensing from R&H Theatricals, and its score will be published by Imagem Music, each a division of the Imagem Music Group. Based on Stephen King's best-selling novel, CARRIE features music by Academy Award winner Michael Gore (Fame, Terms of Endearment), lyrics by Academy Award winner Dean Pitchford (Fame, Footloose), and a book by Lawrence D. Cohen (screenwriter of the classic film). 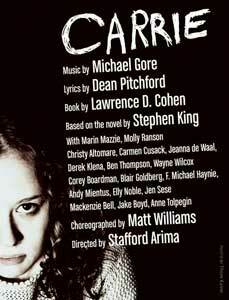 CARRIE’s return to New York this spring marked nearly 25 years since the musical’s historic Broadway production. Preceded by Stephen King’s debut 1974 novel and Brian De Palma's classic 1976 film, the stage musical had its world premiere as a co-production of the Royal Shakespeare Company in Stratford-upon-Avon in February 1988; it transferred to Broadway later that spring, where it lasted for 16 previews and 5 performances before closing, taking on legendary status as one of Broadway's most controversial and short-lived productions. Despite frequent entreaties from loyal fans (and a few unlicensed productions in the US and Europe), CARRIE was kept hidden from public view. In 2009, the authors were approached by director Stafford Arima (Altar Boyz, The Tin Pan Alley Rag) whose passion for the piece led to this newly reworked and fully re-imagined version of the gripping story. The time period was reset to today, giving the story new relevance in its harrowing depiction of teen bullying. Both timely and timeless, CARRIE is the mesmerizing story of a young girl bullied by her peers in high school and mistreated by her fanatical mother at home. Carrie, however, learns she has special powers -- a discovery that leads to a devastating and unforgettable conclusion. "I have known the authors of CARRIE for many years," says Ted Chapin, President of Rodgers & Hammerstein, "and it has been fascinating to watch as their relationship to the material continued to evolve. When I saw this new version at MCC this year, I felt they had successfully walked the delicate line that a stage musical of this story requires -- and came out with an extraordinary and emotionally complex show that played like gangbusters. I am thrilled that we are now representing the show and the score, and are able to make it available to theaters around the world." In a joint statement, Cohen, Gore and Pitchford stated: "We couldn't be happier that our new version of CARRIE will at last be sent out into the world to continue its adventure and journey of resurrection. 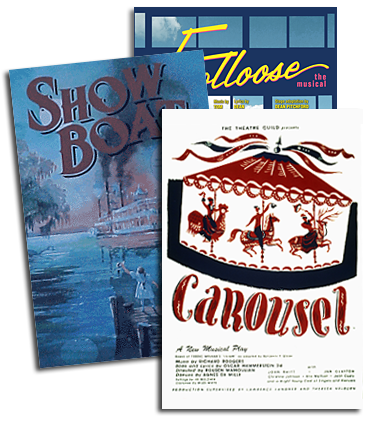 We're especially proud that our musical of Stephen King's iconic fable -- with its emotionally driven narrative and strong contemporary resonances -- will be a part of a stellar catalog alongside the classics of Rodgers and Hammerstein." While CARRIE is currently not available for licensing, theater organizations are welcome to sign up for our email newsletter, Show Business, where they can be the first to learn when it is released to customers. Click here for more information on CARRIE, or follow us on Facebook, or Twitter @RnH_Org for updates.